Wake County should be one of the most competitive battlegrounds in next year’s midterm elections. How well the eventual Republican Senate nominee does in urban counties like Wake will go a long way in determining whether or not Kay Hagan gets reelected. Beyond that, there are also a number of House and Senate seats that are sure to be competitive. Let’s start off by looking at the House races. If Democrats want to take back the House, then they’re going to have to run the table in Wake. Bob Geary of the Indy Weekly, prescribing how Democrats can take back the state government, wrote: Focus on Wake. That’s good advice for Democrats. HD-35 (Chris Malone) – This is actually a fairly strong district, though Chris Malone majorly underperformed here due to a last-minute scandal. I thought Malone was going to lose on Election Night, though he squeaked by. Given the circumstances of his last bid, it’s possible that Malone will win by a bigger margin than he did in 2012. Malone already has an opponent, Democrat Brian Mountcastle, a businessman from Knightdale who describes himself as “middle of the road”. A moderate profile is a must for a Democrat running in this district that went for Mitt Romney with 55% of the vote. Unusual for Wake County, there is a decent number of conservative Democrats here who tend to split their tickets. In a bad environment for Republicans, Malone will have trouble getting reelected. In a Republican wave year, he’s certain to win. HD-36 (Nelson Dollar) – This district comprises parts of Cary, Swift Creek, and some of the more rural areas of Wake County. Dollar didn’t win overwhelmingly in 2012 when he was up against a weak opponent, but this district is a few years away from being competitive. Dollar survived Democrat wave elections in both 2006 and 2008, and in a tougher seat, so he ought to be safe for the time being. Mitt Romney won here with 55%. Dollar has no announced opponent. HD-37 (Skip Stam) – Skip Stam has the safest Republican seat in Wake County. HD-37 contains part of Stam’s home in Apex, but also some of the more rural areas in Holly Springs and Fuquay-Varina, which makes this seat strongly Republican. Romney won here with 57% of the vote and the seat should be safe for Stam or another Republican through the end of the decade. Stam has no opponent yet. HD-40 (Marilyn Avila) – Marilyn Avila’s solidly Republican seat was made much more Democratic through redistricting, but it’s still a pretty safe seat. The 40th district goes from northwestern Wake County and stretches down to Morrisville, where changing demographics are causing a strong Democratic trend. Avila should be safe this cycle, but this could be a toss-up seat by the end of the decade. Mitt Romney carried the 40th by just 6 points, 53%-47%. Avila is still without an opponent. HD-41 (Tom Murry) – Murry occupies one of the most competitive seats in the state. He narrowly won reelection by 3 points over Democrat Jim Messina in 2012, and he already has a challenger for 2014: Gale Adcock, who serves on the Cary Town Council. Adcock has a reputation for being a moderate and should be a stronger candidate than Messina. Adcock won’t even say if she supports transit, the cause celebre among Wake County liberals. Being a woman will benefit her, as will her bland and inoffensive brand of politics. Murry should hope for a Republican wave. The northern part of the district is trending strongly Democratic, and Obama actually won the 41st by slightly less than two points. HD-49 (Jim Fulghum) – Fulghum is a freshman representative who won a close victory over Democrat Keith Karlsson last year. One Democrat has announced so far, Kim Hanchette of Raleigh, a diabetes educator. Hanchette seems to be pretty liberal and will run on education, jobs, and Medicaid expansion. Mitt Romney carried the 49th by 6 points, about the same as Fulghum’s margin. For now, Fulghum has the edge but if the momentum shifts to the Democrats once again, he will be in trouble. The good news for Democrats? 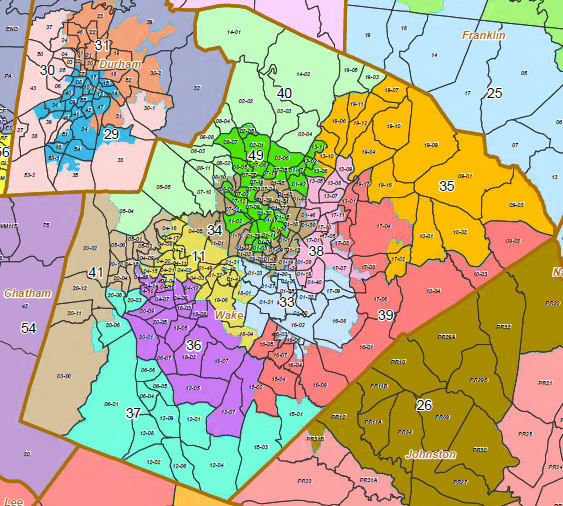 In Wake County, they have nowhere to go but up and Republicans have nowhere to go but down. This is after a 2013 off-year election where Wake County Democrats scored big victories. Republicans are arguably overextended. If there’s a Democratic wave, Wake County Republicans will be devastated. But this is looking much less likely than it was even just three months ago. Regardless, Republicans will be on defense here. Related: Democrats have a 55-37 edge on the generic ballot in the Triangle area. What the GOP does during the short session will go a long way toward determining whether or not those numbers hold.